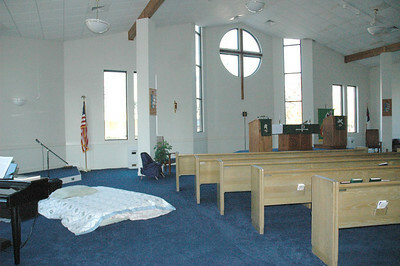 Some churches have limited capacity to house volunteers. 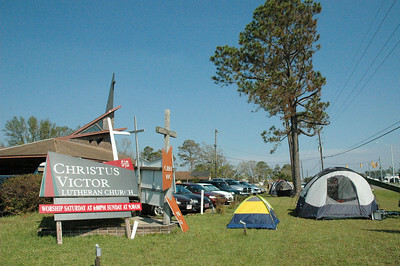 Lutheran Disaster Response coordinators are pitching tents to house volunteers who are needed for clean-up work in Hurricane Katrina-affected areas. 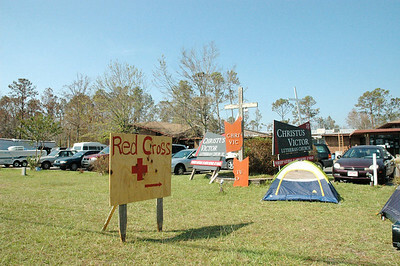 Christus Victor Lutheran Church, Ocean Springs, Miss., has become a 24-hour health clinic, shelter, food and supply distributor and intake center for the Red Cross. ELCA Presiding Bishop Mark S. Hanson (far right) met with members of Christus Victor Lutheran Church, Ocean Springs, Miss., local Lutheran Disaster Response coordinators and others Sept. 21 to learn more about Lutherans working to meet the needs of hurricane survivors. 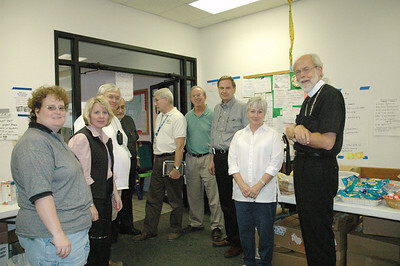 John Gilbert (third from right), former board chair, Thrivent Financial For Lutherans, and Heather L. Feltman, (second from left), director for Lutheran Disaster Response and director for ELCA Domestic Disaster Response, accompanied Hanson. 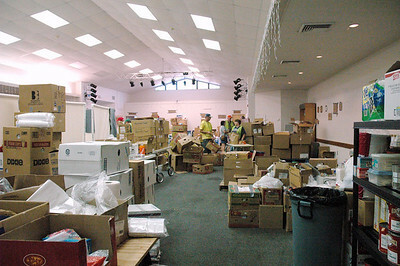 Fellowship Hall at Christus Victor Lutheran Church, Ocean Springs, Miss., has turned into a 24-hour food and supply distribution center. 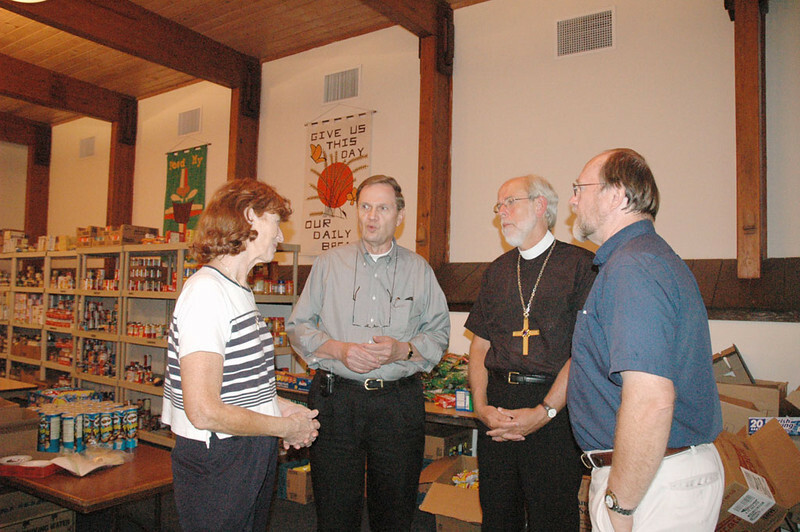 John Gilbert (second from left), former board chair, Thrivent Financial For Lutherans, and the Rev. Mark S. Hanson (second from right), ELCA presiding bishop, meet with the Rev. Gerald D. Bultman, pastor, Bethel Lutheran Church, Biloxi, Miss., and Judy Bultman. Bethel is providing free food, supplies and health care to survivors of Hurricane Katrina. 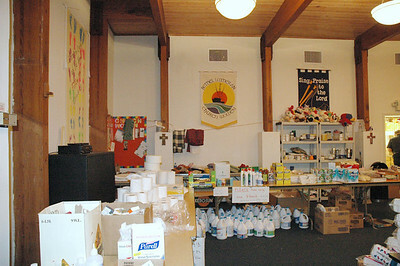 Fellowship Hall at Bethel Lutheran Church, Biloxi, Miss., is now a food and supply distribution center serving survivors of Hurricane Katrina. 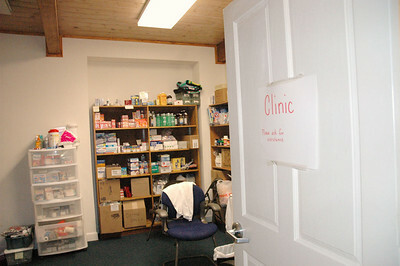 Library turned health clinic at Bethel Lutheran Church, Biloxi, Miss. Bethel Lutheran Church, Biloxi, Miss.